DIGICEL Cup talent will carry the hopes of Papua New Guinea rugby league fans in the Prime Minister’s 13 annual clash on Sept 23. The PNG PM’s 13 team was announced yesterday by PNG Rugby Football League chairman Sandis Tsaka along with the naming rights sponsor, the National Gaming Control Board. 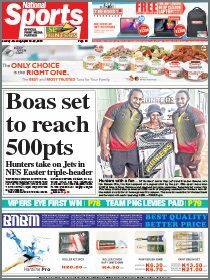 The team is dominated by players from the PNG National Rugby League Competition with four SP Hunters in Karo Kauna Jr, Muka Peter Kulu, Gahuna Silas and William Mone in the side. Of the four only Silas has played more than 10 games in the Q-Cup. Former Hunters forwards Timothy Lomai and Tuvi Lepan have also made the 18-man squad. The PNGRFL picked a side of Digicel Cup and Hunters players in last year’s fixture and it was subsequently thrashed 50-0 by the Australians. The National Gaming Control Board-sponsored team was put together by the national selectors under the chairmanship of Kumuls and Hunters coach Michael Marum. “The team will be coached by Michael Marum with Digicel Cup coaches Stanley Tepend (Tigers), Steven Nightingale (Gurias), Rodrick Puname (Wigmen) assisting as he will be with his Hunters side in Brisbane for the Q-Cup grand final on the same weekend,” Tsaka said. The Q-Cup grand final takes place on Sept 24 at Suncorp Stadium, Brisbane. Marum said they had been restricted with choice with the Hunters squad being unavailable while the other overseas based players were also unable to be considered because of various reasons. But he maintained the side picked was representative of the best performing talent in the top domestic competition. “Unfortunately we couldn’t get our overseas-based players to come up and strengthen up our side,” Marum said. Marum said the team would assemble on Sunday for medical tests with shadow players on standby — the shadows will be named next week with the team’s captain. “There is nothing you can do in one week. They will probably be four or five sessions so the main thing is for them to know each other and go out there next Saturday and play with pride in representing the country. Marum said St George Illawarra’s Nene Macdonald was recovering from a sore knee while Cronulla’s Sharks James Sereyaro had an arm injury and Canberra’s Kato Ottio was getting back to 100 percent fitness for the World Cup. Others like Rod Griffin and Rhyse Martin were still playing finals football, while the England-based players are also unavailable with their teams in the playoffs. Tickets for the PM’s 13 will be sold at the same outlets where the SP Hunters tickets are purchased and the prices for the tickets would be announced next week. 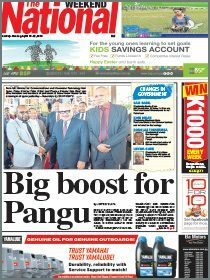 PNG PM’s 13: Brendon Gotuno (Port Moresby Vipers), Charles Simon, John Andy, Joe Joshua, Timothy Lomai, Junior Rop, (Lae Tigers), Dilbert Issac, Jason Missian, Stanley Olo, Tuvi Lepan (Agmark Gurias), Eddie Daffa (Goroka Lahanis), Joshua Nane (Enga Mioks), Junior Rau, Stanford Talita (Hela Wigmen), Karo Kauna Jr, Muka Peter Kulu, Gahuna Silas, William Mone (SP Hunters).